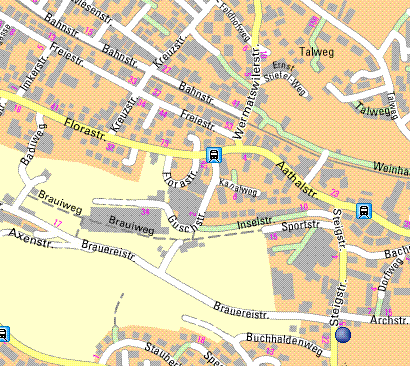 You will find us in the district of Oberuster at Archstrasse 2. Appointments by arrangement. Take the S5 or S15 [rapid-transit railway] to Uster and then from Uster railway station by bus no. 845 or 814 up to Oberuster. It is then 5 minutes’ walk from the bus stop (see map). If you go by car, you can take the exit to Uster-West from the Oberlandautobahn motorway, then drive towards Uster via the railway crossing gate and go to Steigstrasse road on the left-hand side after the service bridge. Archstrasse road is the second cross-road on the left. Our building is directly at the corner.